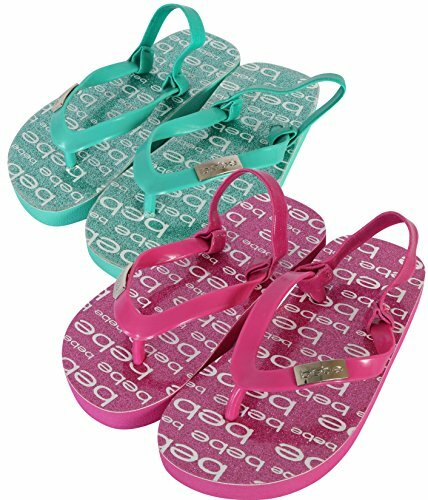 Bebe toddler girl's glitter flip flop EVA sandals are perfect for your little girl. Great for warm weather wear and lounging around the house, she will love the fashionable glitter footbed with Bebe logo print detail. These classy sandals will be your daughters go to for summer footwear. Stylish pearlized upper trim with Bebe logo sole adds to the stylish look of this sandal Convenient slide on design allows for easy on easy off while the back strap provides a secure fit Quality designed, durable sole for long lasting comfort even after a long day on her feet Classic open toe flip flop provides a great fit and breathable comfort for hot summer days, a great look for any occasion Two Pack Value with different colors to choose from so you can pick the perfect one for any outfit; Please Reference the Variations for All Available Sizes & Colors! Treat your little girl to her new favorite sandal by Bebe. She will look great at any summertime event while staying comfortable during hours of play. Stop by Our Storefront to See the Rest of Our Great Deals!